Series of high-resolution numerical simulations of three-dimensional mantle convection were performed to examine the interaction between the drifting continental lithospheres and the underlying mantle structure for 250 m.y. 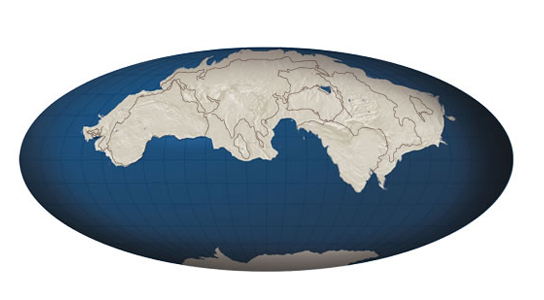 from the present, and to predict the configuration of the future supercontinent. The density anomaly of the mantle interior was determined by the seismic velocity anomaly from global seismic tomography data sets, which contain well-resolved subducting slabs. The present-day plate motion was imposed for the first stage of the simulation as a velocity boundary condition at the top surface boundary, instead of a shear stress–free condition. The switching time from the plate motion boundary to shear stress–free conditions was taken as a free parameter. The results revealed that Australia, Eurasia, North America, and Africa will merge together in the Northern Hemisphere to form a new supercontinent within ∼250 m.y. from the present. The continental drift was assumed to be realized by plate-scale mantle flow, rather than large-scale upwelling plumes. That is, continuously moving plates at the surface for the first stage of the simulation are mechanically coupled with the subducting slabs in the mantle; this enhances the underlying mantle downwelling flow. As a result, persistent continental drift can be reproduced for long future time periods even though top surface boundary conditions may switch in response to shear stress–free conditions. The configuration of the numerically reproduced future supercontinent in this study is broadly consistent with the hypothetical model of Amasia as indicated by previous findings from geological correlations and a paleogeographic reconstruction.